I've just returned from a wonderful weekend in Palma. The trip to the capital of the Balearic island of Majorca was at the invitation of my client Employment Solutions. Laughter, fine dining, song and drink were in plentiful supply during their team-building weekend. There was however time to explore and put my iPhone to work. Palma's old quarter, with narrow streets, cafes, shops and remarkable architecture, all packed within a single square kilometre, is a great place to stroll and get a sense of the heart and soul of the city. Extremely characterful, the photo opportunities present themselves at the turn of every corner. 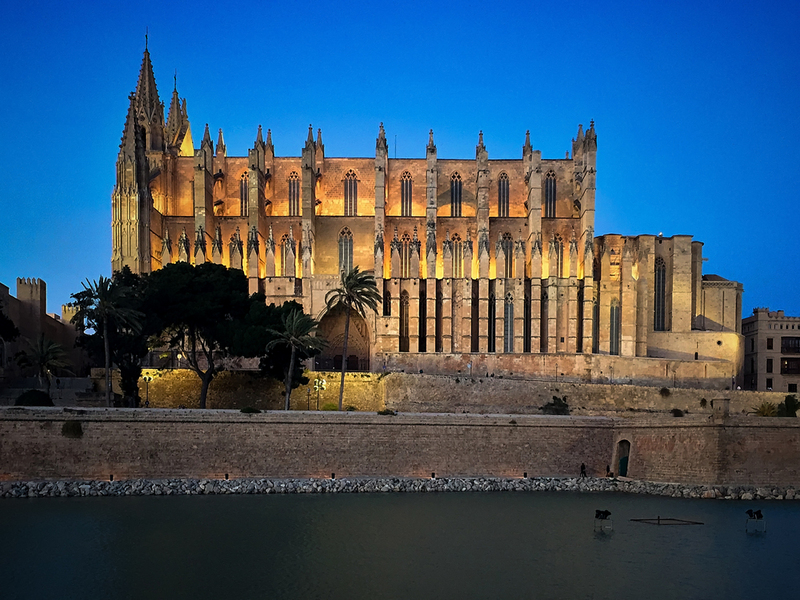 The 'jewel' in the city is Palma Cathedral, also known as “La Seu” or the “Cathedral of the Sea”. A vast and imposing Gothic structure, overlooking the Mediterranean Sea, dominating the Palma skyline. Construction was ordered by King Jaume I in 1229, taking over three hundred years to complete in 1601. There are contributions to the cathedral's stunning interior by Antoni Gaudi and it is breathtakingly beautiful both inside and out. The history and culture of Palma extends beyond the magnificent Cathedral and old town. Es Jonquet is an example, originally a neighborhood of fishermen and sailors, featuring windmills, old city walls and quiet cobbled streets. The windmills that once ground grain are today a silent reminder of the city's ancient and humble past. Majorca is an island of course, one is never far from the Mediterranean Sea. With awesome sunrises and stunning sunsets, the vast marina and port conjure up some memorable vistas and memories. Katrina and I certainly enjoyed our short break and we both agree to return to explore more. The iPhone performed well and again proved itself to be a more than adequate travel camera.